The weather is going to turn nasty in a big way once again tomorrow. I was going to roll the dice and go to San Antonio tonight then only have 2 hours to go in the really bad stuff. I ultimately decided against doing this. I can feel myself pressing to get back into action and with good reason as I am booked solid for the foreseeable future. Trust me Falcon Fans….I am not sleeping well at the moment. Gotta think big picture though and challenging this latest arctic blast would not have been wise. Gonna give you all a warning. We have a “softy” alert dead ahead, but I just have to talk about this. The count is up to 9. Nine what you ask? 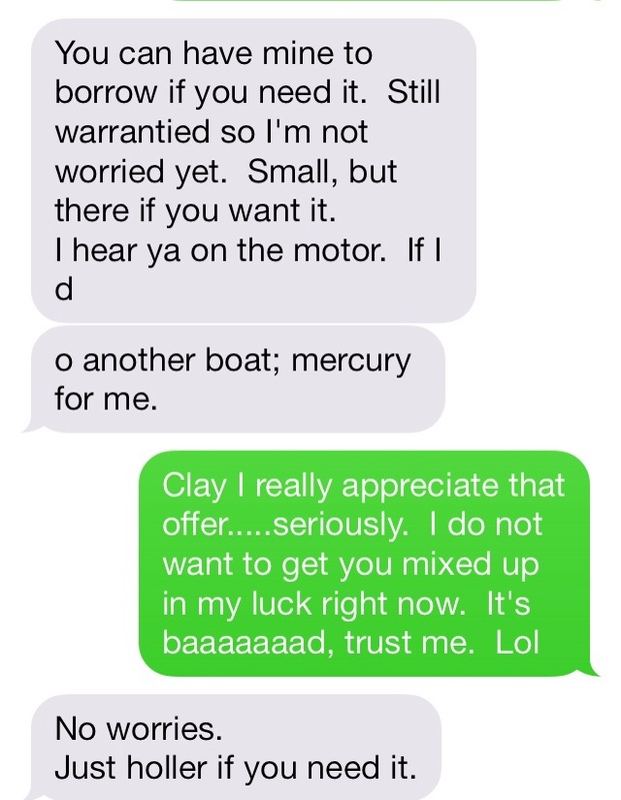 Nine different people have contacted me offering up their bass boat for me to use from as far away as Missouri. I am really at a loss for words. Two of the phone calls I received were from folks that I have never met or talked to. Trust me, I will talk about those calls for years and years. I also had guides like Jimmy B. and Mr. Law burning up the phone lines on my behalf. Then there are my clients/friends. Check out a text that I got from Clay. Simply amazing people read this blog/report and you know who you all are……..and there’s a lot of ya. And of course my number 1 sponsor, as always, is ready to go at a moments notice.